Geek's Guide to Britain There are plenty of tourist attractions scattered around the coast of Cardigan Bay in Wales. But for the last four decades, the Centre for Alternative Technology (CAT) has provided something appropriately... alternative. 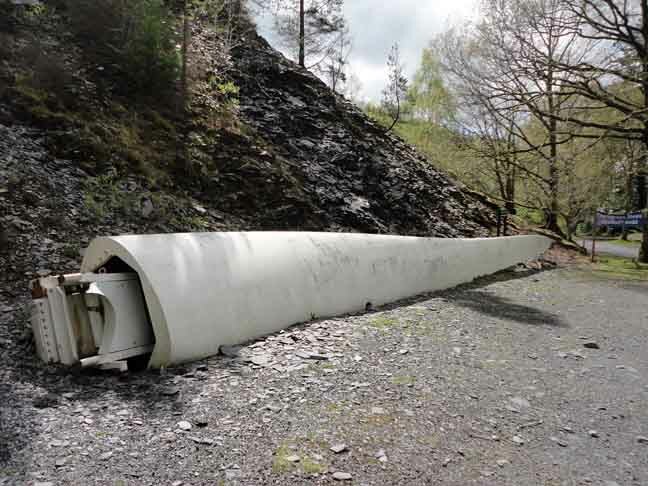 There is an early sign of this in the car park – a huge wind turbine blade, placed as if to diminish the fossil-fuel powered vehicles alongside it. The centre itself is at the top of a steep slope, on what was once the waste pile for a nearby slate quarry. Visitors have a choice of renewable energy transport options: drive your electric car to the free recharging point at the top; catch a funicular cliff railway powered by water; or take a stiff walk up the Garden Steps. I opt for the railway, which as it travels up a 34 degree slope provides fine views across to Tarren-y-Gesail, one of Snowdonia’s mountains. Emerging from the wooden building at the top of the railway, there is a scenic lake, which provides the water to power the railway – the car at the top gets a full tank, the car at the bottom has its emptied and gravity does the rest – along with gardens and a few buildings. It looks quite bucolic. Founded 40 years ago by environmentalist Gerard Morgan-Grenville, CAT has a mission based on science and engineering: to teach visitors about renewable technologies such as wind, solar and hydro-electric power, as well as efficient use of other resources such as water. Spread out across seven acres, it does so through exhibits, installations on different power sources and by offering the public the opportunity to study through a range of courses with everything from free water efficiency days for plumbers to a Masters Degree in renewable energy. The centre isn’t just about teaching, but also very much about experimenting and putting things into practice – learning along the way as well as demonstrating to the public what’s possible. To that end, you’ll find the centre’s eco house and organic garden, composting and soil experiment, and alternative building construction methods. Some activities, such as that garden and those soil projects, were drive by the fact CAT was scratched from the barren and rocky wastes of a slate quarry some four decades back. There is a suggested route visitors can take around the centre, although it’s also easy just to wander around. Taking the route, one of the first stops is the Whole Home, an energy-efficient house with lots of advice – some of it surprising, such as the fact that gas ovens produce lower carbon emissions than those using electricity (because of power loss through the national grid). The house also includes a biomass room, featuring modern wood-burning stoves. One is trickle-fed by wooden pellets, the other burns logs in batches and stores heat in a tank, with both used for central heating. Things get more fun further up the path with the Mole Hole for children, a dark tunnel featuring giant models of underground creatures. While this has messages about biodiversity and organic soil, it is also gives kids the chance to squeal at models of creepy-crawlies. The tunnel leads out into a polytunnel organic garden which is warmed by ground heat and therefore doesn’t need electrical heaters. There is also an adventure playground nearby. Further on, a barn by a courtyard has its southern-facing roof covered with 20kW-worth of solar panels; this was a large installation when the centre put it in a few years ago, but similar ones are now commonplace. This one is particularly pretty, as it uses semi-transparent integrated photo-voltaic panels that let a lattice of sunlight through.